My grandfather had started drinking before he came home from the war to find a wife who no longer wanted him and a country that no longer needed him. He was a broken man long before I knew him, an itinerant carpenter and sometimes fisherman. He lived with several women, whom my parents euphemistically called his wives. Mostly he lived alone. When he wasn’t drinking my parents would let me visit him. I’m 12, standing by a canal in Naples, Florida, with Pop, fishing with a cast net. It’s cool, late afternoon. Maybe morning. We have a washtub, a large one, and we are filling it with fish. Literally filling it, 30 or more good-sized mullet, 10 to 12 inches long. They run in schools along the sea wall, especially in cooler weather, and we haul them in with every cast, five or six at a time. In just a few minutes we have more fish than we can clean and store in his small freezer. We walk back to his home, wherever that is. He is always moving. He carries three or four of the mullet into the kitchen, leaving the tub outside to take care of after dinner. Or after breakfast. It doesn’t matter, really. The meals are indistinguishable. The same every time, except a fried egg or two in the morning. We’ve only been gone half an hour. Grits are on the stove. Coffee too, thicker than mud. He has stirred an egg into the coffee pot, to separate the grounds that settle to the bottom. Pop has filleted hundreds of mullet, and works quickly as the grease heats up. The gills are deep red, the eyes clear, the flesh translucent. He cuts off the section near the tail, a special, boneless treat, and runs his knife along the backbone of each side. 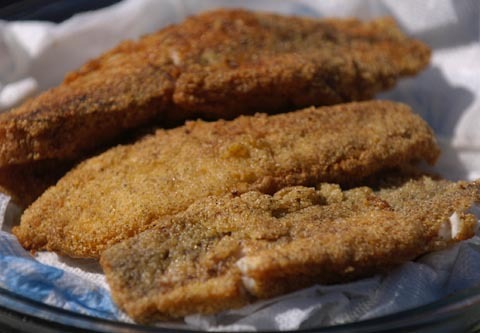 He rolls the fish in flour and cornmeal and drops the fillet into the hot oil as it crackles and spatters on the stove. As the fish are frying he beats cornmeal, onion, and milk together, and after setting the fish on a paper towel drops spoons full of batter into the hot grease. I clean up some dirty dishes from the sink and we sit down to eat. There is not a vegetable in the house. Not a green one, anyway. Somewhere my future wife is growing up in the Midwest, eating sweet corn a few minutes from the stalk. My corn is dried and coarsely ground, smothered with butter and salt. But even today, almost fifty years removed from living by the gulf, I crave that fresh saltwater fish a few minutes from the bay—hot, juicy and oily, served with hush puppies. I think that’s what Jesus served his disciples on the shore of the Galilee, after the resurrection. “Come and have breakfast,” Jesus said. It proved he was alive. “Sit down and eat,” Pop said. We marvel at the bounty of our feast. He says grace. We talk about the tides, about the catch, about the sea, as the oil runs down my chin. And in that moment my grandfather was most alive to me, as broken as he was. There was not a moment when I loved him more, understood him better, or forgave him as much. It is always so, at a common table, sharing a common grace. Food brings us together and points us to God, the giver of fish and bread. And Christ, as perfect as He is, will be most alive to us when we feast with him at the Marriage Supper of the Lamb. See also okra for lunch, just enough is plenty, what’s for lunch and simple summer suppers. Heat oil to 375 degrees F in deep saucepan. Whisk together egg and water in a shallow dish. Combine flour, cornmeal, cayenne, salt and pepper; mix well. Dip fillets into egg wash, then into flour mixture to coat. Deep fry fish in hot oil for 4-5 minutes until fish is golden brown. Drain on a paper towel. Mix the dry ingredients together and add the milk and water. Stir in the chopped onion. Add more meal or milk as may be necessary to form a soft but workable dough. Drop by the spoonful in deep hot oil used to fry fish until well browned. Made my mouth water. I love it when you write like this! Full of kindness and grace and human interest. You have to know we are going for fish lunch, now. I had to share this with my Mom. She grew up in the South and has regaled us for years with stories involving the Gulf and freshly caught fish and seafood. The longing and nostalgia in her voice during these stories echoed in my mind as I was reading this.